Ralph Nader is still a hero. Photograph by Trixie Textor/Getty Images. He looks like a ghost. A tall, hulking, haunting figure. No, it’s more like he looks haunted by a ghost. And he is. I’m talking here about Ralph Nader, whom I sat next to at a recent benefit. 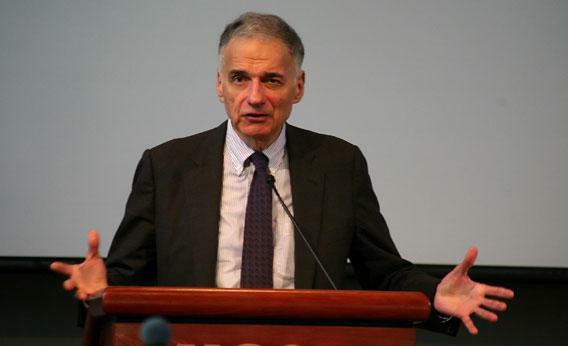 Watching Ralph Nader, you feel that he does suffer with the people who suffer. He’s not a cold-blooded diagnostician of the diseases of corporate power; this is not some clinical operation he’s been running. He may be cynical about the perpetrators, but not the victims. Ralph Nader has done so much good in his career, exposed so much corporate and government corruption—so much bribery, law-breaking, malfeasance, malpractice, product defects, drug company-subsidized science. And he has a remarkable record of laws that resulted at least in part from his exposés. One wonders what we’d do without him and the numerous watchdog agencies he’s given birth to; the generations of idealistic public interest lawyers and activists he’s inspired; the tireless work that has led to legislation, regulation, reparation, prosecution, public outrage, all of which have—or should have—changed the way we look at the unchecked operation of naked capitalism. Ralph Nader has had an effect. The malefactors of great stealth have had to learn to worry that Ralph Nader is forever looking over their shoulder. And yet it never stops. The crooks in the expensive suits and suites have found that however much light Nader sheds on their dirty deeds, they generally get away without jail time. They go on inventing new and dirtier deeds, a constant proliferation despite all the exposure. The system that spawned them seems unable to correct itself. All their whining about onerous regulation works: They’ve brainwashed the Tea Party dupes into an anti-regulationist frenzy, the kind of peerless obstructionist stupidity that puts their own families in danger. But Nader never gives up. He’s always been one of my heroes. Still, when I happened to be seated next to Nader at this benefit recently I wondered about that haunted look. The last time I saw him in person, some 15 years ago, he was just as haggard-looking. Now he’s nearing 80, and he scarcely looks a day older than he was then. It could be my imagination but his look now had an element of the tragic to it. I’m speculating, of course, but to me he seemed haunted by history, by a cruel twist of fate. By Florida, 2000. By the charge that his five-figure vote total in that corrupt state’s presidential election changed history, bequeathing us Bush, Iraq, Abu Ghraib. Did he have any second thoughts? Could he have done something different back then? Might he have taken a tactical retreat from principle for an imagined greater-good, or lesser-bad, back in 2000 when the race seemed so close? Does his campaign now haunt him? Has he reconsidered his decision to run or not to drop out? Because many of those who were once his fans, followers, and admirers turned on him after Bush was named president by a partisan Supreme Court. Mention Nader’s name to some of these people now and they snarl. “He gave us Bush! He was only thinking of himself!” Not that they’re doing anything noble or selfless with their lives, but they can blame everything—the great decline, the war crimes, the brilliant investment banking scams that blew up the economy—not on George W. Bush, nor the lame candidacy of that hapless loser, Al Gore—but on Ralph Nader. For doing what he’s always done, for following his principles, acting as the conscience of both parties. It’s an American tragedy. This is something I learned in the days after my recent encounter with him. When I’d tell friends about it, tell them the guy is still on the case, advise them to pick up his most recent book , Getting Steamed To Overcome Corporatism, which, with its old-fashioned title, was a sourcebook of investigative outrage that in many ways anticipated Occupy Wall Street (and—it seems—has outlasted it). Telling my friends about my Nader encounter, I was stunned at the vitriol some expressed. About how Nader supposedly lost the election for Gore and won it for Bush because of the 97,000 votes out of millions cast that made the election close enough for a partisan Supreme Court to steal it (or at least prevent a fair recount), by putting its thumb on the scales of justice. The exact kind of crude and corrupt act that Nader had spent a lifetime fighting against. A few friends were more sympathetic. Why is it, one asked, that people blame Nader rather than the fatuous Al Gore, who crucially failed to win his home state and, in a masterstroke of strategic genius, failed to ask Bill Clinton to campaign for Gore in his home state of Arkansas, either one of which would have made the Florida outcome irrelevant? Why not blame Gore for failing to attract a greater share of the registered Democratic voters in Florida? So for the haters, Nader takes the fall for all the sins of the Bush era. Not Bush, not the guards at Abu Ghraib, not Lehmann Bros. Nader. I held my ground. It may have been my last chance to offer that apology. And now I wonder whether my eagerness to offer an apology had something to do with a desire to apologize for the larger injustice: the way a certain smug think-tank liberal segment of our culture has treated him. No. More than that, to apologize for the way the cruel whimsy of history has treated him: a crusader for justice ambushed by unjust obloquy. I scoffed at the time. This was a prominent periodical with a reputation for integrity. But it turned out, I had discovered one mistake too many. I was summoned to the office of the head of the hospital where the wrong-side-of-the-brain operation had been performed. I’ll never forget the aura of power that radiated from his vast desk in his vast office: New York power, the inside track. I’ll never forget the none-too-subtle way the hospital chief let me know he was very close friends with the magazine’s editor. He was just as confident it wouldn’t be printed as Nader, but smugly so. Long story short: After major rewrites “for balance,” the magazine accepted the story, paid me in full for it—and never ran it. I later learned that one of the other editors there had a wife being treated at the hospital, which may have also figured in the fate of the piece. It was a lesson in how power works in New York City, the kind of thing Nader exposes every day. I was naive not to take his prophecy about it seriously, to underestimate the sagaciousness of his analysis, and I felt I owed him an apology for doubting him. Nader didn’t remember the conversation, but he was gracious about my apology, and during the course of the dinner proceeded to tick off a litany of medical-related scandals that he chronicles in his most recent book, many of them having to do with the health care system and the obscene profits and powers of the drug companies, profits and powers that allow them to cover up their devastating errors, their biased drug trials, their medical device mistakes, that allow them to peddle worthless or harmful pills. He went from there to the Wall Street casinos that continue to play idiotic games with taxpayer-funded bailout billions. It’s a great compression of our economic situation and I also like the linguistic touches, like “in today’s mad world.” The phrase reminds me of a 17th-century play by Thomas Middleton, sometime Shakespeare collaborator: A Mad World, My Masters. Back to the litany of horrors: “76 million annual cases of foodborne illnesses” from corporate agriculture. People still being poisoned by asbestos! By lead! (My old colleague the late Jack Newfield devoted his reportorial life to an anti-lead poisoning crusade, but Nader reports that new toxic metals are poisoning kids every day.) Usurious credit card rates permitted by special deals secured by lobbyists. The Exxon Valdez payout still not finalized! War contractors profiteering off war crimes. Industrial water pollution. The list goes on and on, and it’s all documented. It would take a book to give the specifics, so I really recommend you get a copy of Steamed, because it will change the way you think about America. It’s just that maddening, even in this mad world. At the very least, check out Progressive Populist, the lively, angry publication Nader contributes to. And that’s the thing, that’s why Nader wouldn’t listen to pleas to back out in Florida at the last minute. He genuinely believes both parties are in the pocket of profiteering corporate interests and their lobbyists. The Democrats do little more than impotent whimpering, which merely serves as bipartisan window dressing for Republican corporate puppets. Nader didn’t owe the Democrats any special favors back then. Still, it is one of the tragedies of history that he is painted as the villain of 2000 by some. If only it were just Al Gore who suffered. But it wasn’t. It’s one of those hopelessly complex moral questions that seems simple in hindsight. But not when you’re in the middle of them. Like the famous Trolley Problem in “consequentialist ethics.” One example: Should a trolley swerve off the tracks to avoid running down five men if it risks killing one on the side of the roadbed as a consequence? There’s no good answer. But Ralph Nader’s a good man. He doesn’t deserve the hostility he gets from some. Don’t hate him. He’s still a hero. Oh, and one more thing, Ralph. Let’s not tempt fate again. Please don’t run this time.